Successful business intelligence (BI) requires the ability to harness data for better decision making that helps your organization EVOLVE and drive greater results. Microsoft Power BI consulting services from Blast is the key to unlock your potential. What can Microsoft Power BI Consulting Do for You? Power BI puts you — the business leader — in control of your data analysis and reporting, versus waiting for your IT group or other technical resources to run complex queries and reports that often are difficult to understand. With Power BI consulting expertise, you’ll be able to quickly and easily extract and present your data in a meaningful way to drive Insights + Action. Microsoft Power BI is a suite of business analytics tools to help your organization analyze data and share insights. 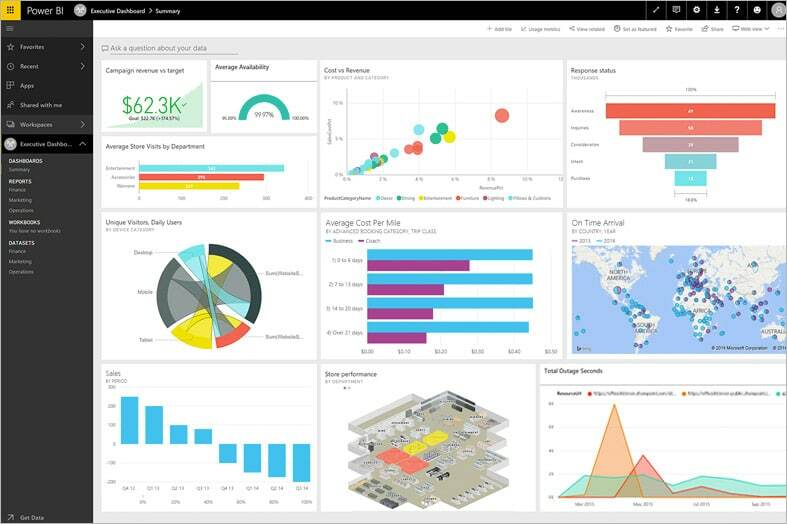 Leveraging rich data visualization with self-service business intelligence capabilities, Power BI provides a 360-degree view for leaders like you, with your most important metrics in one place, updated in real-time, and available on all your devices. Bring clarity to your mass of data by connecting you to what matters. No matter the source — on-premise or in the cloud — Power BI can unify all of your organization’s data with powerful import, ETL, and other data management capabilities. Create and share visually appealing dashboards and reports for delivering actionable insights to key stakeholders. With a single click, you can drill deeper into the data to easily find answers to important business questions. Power BI’s proven adaptability combined with Blast’s expertise in multiple industries, can help your organization EVOLVE. Competing daily for customers’ attention and choice, CPG companies can grow market share through deeper data analysis and trend insights. Manufacturers can track key supply chain performance indicators such as machine utilization, process efficiency, costs, inventory levels, losses, and cycle times. Education, healthcare, infrastructure, and other government organizations can leverage business intelligence to improve service and relationships with constituents. To maximize sales, profits, and loyalty, retailers can achieve a deeper understanding of customers, pricing, POS, inventory and channels. Amidst increased regulation and competition, businesses can leverage BI to improve operations, maximize profitability, increase customer retention, and more. Analysts: Rapidly go from data to insight to action. Connect to hundreds of sources, prep data easily, and create actionable reports. Business Users: Always be in the know. View dashboards on any device, get alerts when KPIs change, and drill into details. Information Technology: Simplify management, achieve compliance, and secure data while giving people access to insights. Developers: Bring your apps to life with data. Easily embed interactive data visuals and deliver compelling reports on any device. Certified Microsoft Power BI consultants can optimize your return on analytics investment (ROAI) by helping you efficiently execute a sound BI strategy and avoid common missteps. Leveraging our unique SIOT methodology — strategy, implementation, optimization, and training — Blast’s Power BI expert consultants will work with you to ensure you have the insights you need to EVOLVE your organization. Make Your Mark by taking action on insights gleaned from your Power BI dashboards by improving results for your organization, customers, and other shareholders. Blast’s Power BI consultants are ready to help you gain real insights, in real-time, with self-service business intelligence. We will guide you on everything from Power BI best practices to Power BI cost, help you compare to alternatives (like Tableau, Domo, etc), provide a demo, and address other Microsoft Power BI questions you have. If you have questions or are ready to discuss how Microsoft Power BI Consulting can help you EVOLVE your organization, talk to a Blast Solutions Consultant today. Interested in analytics consulting beyond Power BI data visualization? Explore the breadth of services that our data analytics consultants provide.